Technical advances in offshore installation and floatover capabilities have allowed for the fabrication of complete topsides weighing upwards of 50,000t. ALE is continually developing new ways to safely load out such structures using strand jacks, integrated skid systems, SPMTs and high-capacity ballasting systems. As a result, the company has successfully loaded out more than 1,000 such structures around the world. One of ALE’s most recent innovations, the Mega Jack, is capable of lifting platforms of up to 50,000t to an elevation of 25m. ALE’s specialist services support every stage in the project lifecycle, from front end engineering design (FEED) to the decommissioning of offshore facilities. The company has state-of-the-art integrated ballasting systems with a typical capacity of over 60,000m3/hr, advanced weighing equipment and a dedicated marine engineering division. With world-leading expertise in all of these areas, ALE offers a complete cradle-to-grave service in offshore skills. ALE’s specialist services include weighing and onsite moves for both smaller pieces such as bridgeways and derricks and complete fabrications such as jackets and topsides. Continuous health, safety, quality and environment (HSQE) improvements are a fundamental part of ALE’s ‘smarter, safer, stronger’ ethos. Although extremely high, the company’s standards in these four areas are continuously reviewed and refined so it remains at the forefront of the industry. ALE recently completed the topside load-out, float-over, offshore lifting and levelling operation of the 13,000t Lu Feng topside in the South China Sea. The Vega gas and condensate field is located in the northern part of North Sea and lies in water depths of 370m. The Vega Pleyade offshore gas and condensate field was developed by Total (37.5%) in partnership with Wintershall (37.5%) and Pan American Energy (25%). 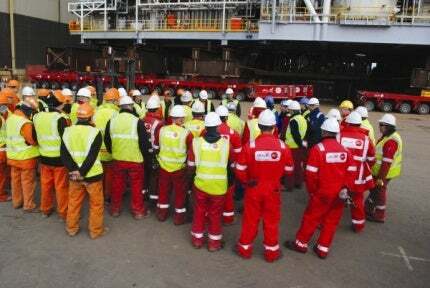 ALE has successfully installed a 14,000t offshore platform in the North Sea. The latest innovation from ALE has been put into action for the first time, during a large bridge exchange project in the Netherlands.